High speed internet service provider BSNL upgraded bandwidth of existing Unlimited Broadband plans in all Telecom Circles under Rationalization of Broadband tariff. 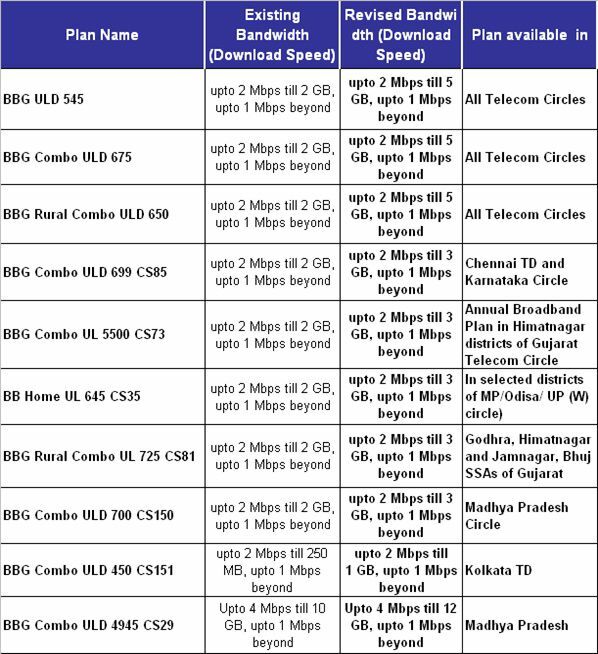 State run Telecom Company Bharat Sanchar Nigam Limited (BSNL) most successful existing Broadband plans BBG ULD 545, BBG Combo ULD 675 and BBG Rural Combo ULD 650 bandwidth upgraded by increasing data usage pre-FUP (Fair Usage Policy) in India. As per latest information, BSNL competent authority increasing demand and usage of internet has decided to upgrade bandwidth of 2Mbps download speed till 5GB and 1Mbps download speed beyond 5GB data usage from 1st October, 2016. Whereas, the existing download data usage limit pre-FUP is 3GB is increased upto 5GB based on feedback from customers and various field units across the country. This revision will be applicable to the existing broadband user as well new customers. The above upgradation will be implemented with effect from 1st October, 2016 onwards in all Telecom Cricles.